Myths abound… That is exactly what all the current commotion about multicloud is causing. Although plenty of voices are singing the praises of multicloud infrastructures, they tend to skip over what really matters. We will summarize the benefits that are frequently bandied around – while giving the low-down on the real story. Yes, multicloud strategies are aimed at providing companies with the agility that they need to combine different cloud resources… but not only public cloud resources. This is the first myth: multicloud is not exclusively about public clouds. On the contrary, the upside with multicloud is that it steps neatly around the whole “public cloud vs. private cloud’ issue and instead offers a harmonized approach that addresses the requirements that organizations are actually facing in real life. Multicloud is not a defensive measure against Amazon Cloud Services (AWS) and Microsoft Azure, but a strategic choice allowing companies to keep the resources on premises for security and performance reasons, as well as to safeguard their innovations – we will come back to this. This is the second myth. 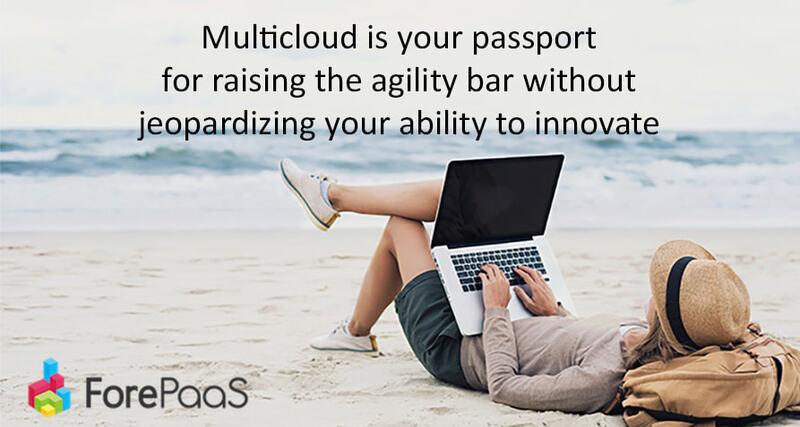 The ability to sprawl across several clouds existed before the word “multicloud” was even coined. In actual fact, what makes multicloud so powerful is its ability to painlessly and seamlessly manage the overhead involved in spreading resources over public and private clouds. Multicloud strategies bring an increase in agility, not capacity. Ultimately, they aim to simplify and accelerate the use of resources from across multiple infrastructures. That is why multicloud does not mean that software companies are restricted to executing a virtual machine in any cloud infrastructure. The idea is to exploit the native characteristics of the different cloud infrastructures to ensure real integration with cloud providers. This is right, and as recent events have shown, cloud infrastructures are not immune to faults or outages. Using different clouds can clearly improve the organization’s resilience. But once again, we are overshadowing multicloud’s real USP. The aim with a multicloud infrastructure is to prevent the strong links that can tie data, applications and infrastructures together. It should not be forgotten that the main cloud providers started off with an infrastructure before offering higher level services. As is often the case in computing, ramping up the number of application layers has led to even greater complexity and forged strong bonds between the different layers. Would you let your electric utility supply your electricity and also make all your electrical appliances? Despite the obvious answer, many companies have nevertheless chosen to use a single cloud service provider to not only host their data and applications, but also “power” them from end to end. #1) The ability to serve a flexible multi-tenant model, in other words, by using shared or dedicated resources, or even a single-tenant model (less is often more). The first case makes you a co-tenant, the second makes you a single tenant, and the third makes you the landlord. #2) Horizontal, fine-grained and seamless scalability for creating multiple instances of the different components of your infrastructure. Since each organization tends to become a software company, multicloud represents a major technological trend. The end goal is clearly to accelerate the digital transformation process while reinforcing individual independence to better safeguard the capacity for innovation. For the vendors involved, it is not only a question of choosing the right technology but making a strong commitment, which ForePaaS has accepted by refusing to become an infrastructure vendor.